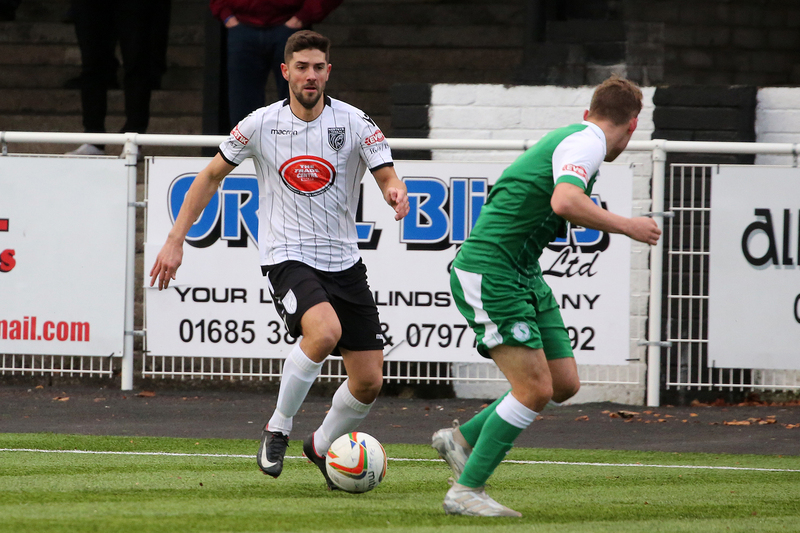 Winger Corey Jenkins on the run for Merthyr Town. Pic: Peter Harman. Merthyr Town travel to play Beaconsfield Town on Tuesday, one of their four remaining EvoStik Southern League matches. The Martyrs won convincingly at Gosport Borough in their latest outing when Ryan Prosser marked his return from injury with a 12th minute goal. Prosser followed up after Gosport goalkeeper Patrick O’Flaherty parried a shot from Ian Traylor. Ian Traylor finished off a fine move to make it 2-0, curling his shot into the far corner from Kerry Morgan’s pass, and Kieran Lewis crowned the win by adding a third after a fine run and cross from Corey Jenkins. Goalkeeper Scott Reed had to make a sharp save low to his right, but apart from collecting a couple of corners was largely untroubled. Craig McDonnell made a welcome return from injury after dislocating his shoulder on New Year’s Day against Taunton Town. Gosport Borough: Patrick O’Flaherty, Harry Medway, Freddie Reed, Ben Harding, Sam Roberts, Matt Casey, Ryam Pennery, Charlie Davies (zapt), Craig McAllister, Sam Lanahan, Ibra Sekajla. Subs: Matthew Tubbs, George Barker, Joe Byrne, Joe Lea, Connor Hoare. Merthyr Town: Scott Reed, Ben Swallow (Craig McDonnell), Connor Young, Matthew Harris, Kerry Morgan (Corey Jenkins), Jamie Veale, Ashley Evans (capt), Lee Lucas, Kieran Lewis, Ryan Prosser (Owain Jones), Ian Traylor. Subs not used: Lewis Webb (gk), Craig Reddy.